To learn more about Kilchis Point, view photographs and track development progress visit our Kilchis Point Blog at www.kilchispoint.wordpress.com. The Kilchis Point Reserve is approximately 200 acres along Tillamook Bay in Bay City, Oregon. The Tillamook County Pioneer Museum (TCPM) owns, protects, maintains, and holds this land in the public trust. Kilchis Point is home to a wide variety of plants (flora) and animals (fauna) that together form precious ecosystems. Declared a County Heritage Site by the Tillamook County Commissioners in 2010, Kilchis Point is an important prehistoric and historic site. Kilchis Point was the site of one of the largest permanent Native American villages on the Northern Oregon Coast. Tillamook County’s first pioneer settler, Joe Champion arrived at Kilchis Point in 1851 and was invited by Chief Kilchis to live in a spruce stump next to the Native American village while he built a cabin. The Morning Star of Tillamook was built at Kilchis Point, making it the first ship built in Tillamook County and the first ship registered in the Oregon Territory. Kilchis Point was also the headquarters of the Whitney Lumber Company from 1919-1927. More than 2 miles of trails allow visitors to explore the area and the rich history of the site through three interpretive trails that highlight (1) Flora and Fauna, (2) Native American Heritage, and (3) Pioneer Settlement. It was very important to us that Kilchis Point be accessible to all. The first circle is paved and the the rest of the trails are compacted gravel. Most of the trails are level and easy to walk. 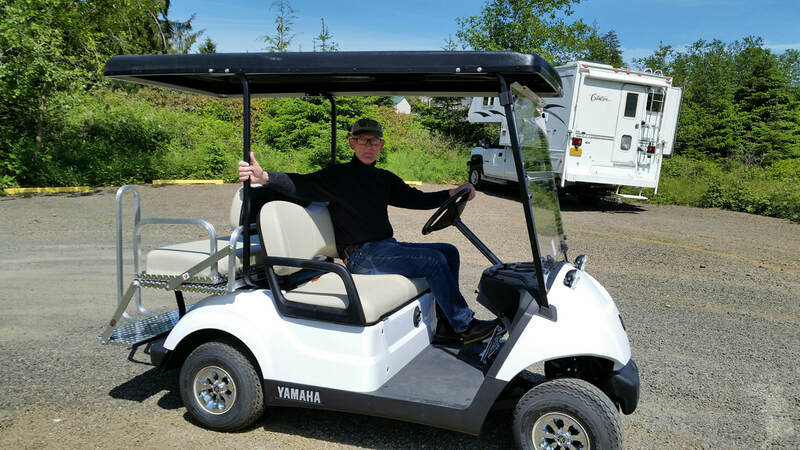 Those unable to walk to the Caitlin Heusser Bird Watching Station along Tillamook Bay and back may request a ride on the "Mike," a modified golf cart. (Named in memory of Mike Brown, one of our first donors to the Reserve.) Rides are subject to availability of the drivers and reservations should be made at least a week in advance. Please call the Pioneer Museum at 503.842.4553 and talk to Gary or Carla to schedule your trip. The Ford Family Foundation designed, funded and helped install the Kilchis Point trailhead area complete with benches and a native garden. A paved parking area, bioswale, and an interpretive kiosk have also been completed with funding from the Spirit Mountain Community Fund. Permeable pavers have been used for the parking area and the Trailhead Loop which is approximately 1/3 of mile, thanks to donations of time and materials from North Coast Lawn. 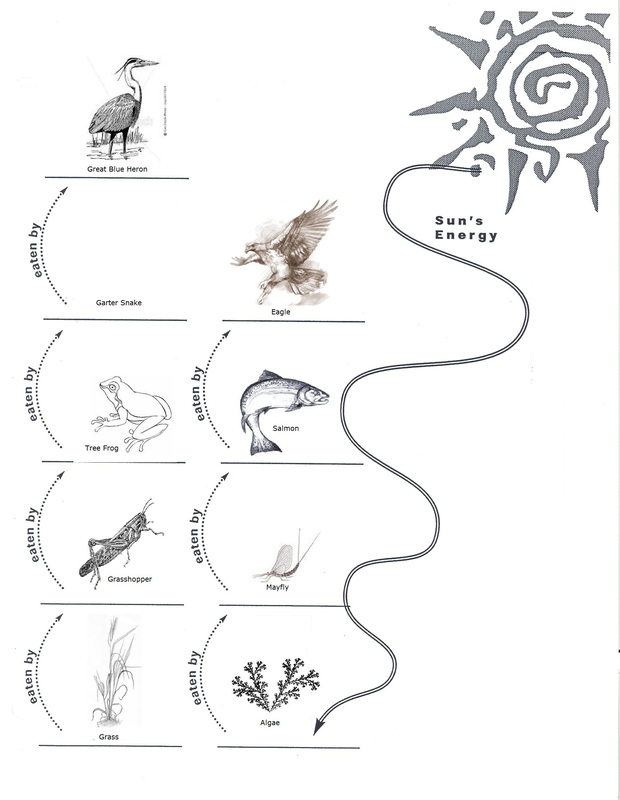 The Trailhead Loop has 17 interpretive signs that give an overview of the history and natural features at Kilchis Point. A convening circle along the trail serves as a meeting place for school groups, visitors, and a gateway to the trail system. Boardwalks are installed throughout the trails to bridge the delicate wetland areas. It is the goal of TCPM to promote student appreciation and understanding of Tillamook’s natural and cultural resources while encouraging the protection and stewardship of resources, environments, and habitats. TCPM’s education committee has developed an educational program for children centered at Kilchis Point. A grant from the Oregon Community Foundation has made it possible to provide students from Tillamook County schools the chance to experience the wonder at Kilchis Point. The education programs are curriculum based and available for all grade levels. Programs are free for Tillamook County Students and TCPM may be able to assist with bus transportation. To schedule an education program please contact the Pioneer Museum at 503-842-4553. Habitat preservation and restoration is one of the top priorities at Kilchis Point. Invasive species such as Scotch Broom and Himalayan Blackberry are being eradicated and replaced with native plant species such as Twinberry, Salmonberry, willows, and Cedar. Over 200 trees donated by the American Association of University Women have been planted near the trailhead area. Volunteer work crews, including adults and students, have contributed to the habitat restoration process including the planting of 4250 Western Red Cedars. The completion of a wetland delineation (2011) and cultural resource assessment (2010) served as the starting points to the process of applying for permits through Tillamook County, the City of Bay City, and many Oregon State agencies so we could begin installing permanent trails and bridges. The Caitlin Heusser Bird Watching Station was dedicated in May, 2015. Located on the southern end of the property on Tillamook Bay near where the Kilchis River enters Tillamook Bay, this is an area where birds are most frequently spotted. 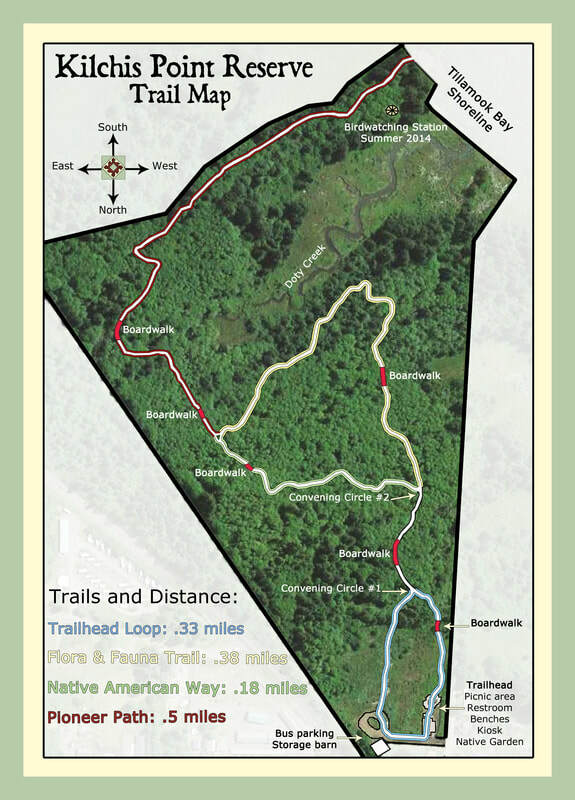 TCPM would also like to someday enhance the trails so they will function as educational and community gathering centers. These improvements will augment visitors’ understanding of the area and provide space to illuminate Kilchis Point’s history. Traveling North on Highway 101 from Tillamook towards Bay City: As you begin to enter Bay City limits (the speed reduces to 45 MPH), turn LEFT on Warren Street (across from Habitat for Humanity Restore). Turn Left on Spruce Street. Traveling South on Highway 101 from Bay City towards Tillamook: Turn RIGHT on Warren Street (across from Habitat for Humanity Restore). Turn LEFT on Spruce Street. Especially made for children, this great activity booklet will help you to explore Kilchis Point and discover for yourself what a special place Kilchis Point can be. Have fun with this special activity book all about exploring Kilchis Point! Visit the Kilchis Point Reserve Facebook page and our Wordpress blog for up-to-date information. Gary welcomes ADA riders on the "Mike." There are many opportunities to help at Kilchis Point Reserve. We have periodic work parties to remove invasive plants, plant new trees or groom trails. You can also become a Friend of Kilchis Point Reserve by making an annual donation. For more information, please call the Pioneer Museum at 503.842.4553.